Welcome to the Dunn's Corners Fire Department Guestbook. Your feedback is important to us. Feel free to leave your comments. I can not thank the Dunn's Corners Fire Department enough for making my Dad's funeral so special. The honor that was bestowed upon him was something myself and my family will never forget. The fire department was very special to him and was a big part of his life. To see how much he impacted everyone's life will stay with me forever. Thank you again. I just wanted to say what a beautiful job you all did for Richard "Cappy" Champlin. I know Junie and met Cappy here in Florida. They are really special people and I loved seeing all the funeral pictures as we were unable to attend. You all did a wonderful job and I am sure his family appreciated it. I had the honor of visiting your station at Dunn's corner this past summer with Cappy's brother and was very impressed!! Thank you for all your hard work on the night of the 14th of January when my mom's house burned at 121 Post Road. All personnel were super professional and abated what could have been an absolute disaster and they are all to be commended. The Ashaway Ambulance crew were very compassionate with my mother and they too deserve kudos for a job well done. No one ever realizes just what police, fire and rescue personal do for people until it is experienced first hand myself included. Again thanks for everything you did a great job! Enjoyed your web site came upon it by looking up pictures of Soap box derby photos blog. I work for a small department about 30 miles west of Atlanta Georgia. Approx. 175 members 10 stations , 10 engines,1 heavy rescue, 1- Air light truck, 1- Trench Truck, Full HAZ-MAT response vehicle, 6 ALS - Ambulances/ 2 ALS ENGINE companies. MCI- RESPONSE UNIT. This is my 25 year in Fire /EMS. With 20 years with DCFD. Keep up the great work for your community. and GREAT JOB ON YOUR WEB SITE!! We usually get major blizzards every other year but this storm is worse than any Iowa blizzard. So from one DCFD to another, stay safe. Great pictures by Rebecca. I would be interested in obtaining copies of her photos. Thank you DCFD for your hospitality. Proud to call you brother and sister firefighters. Be safe. Nice website we seem to work together good at tanker operations. Thanks for the tour Mike . The patch will be in the mail next week . THANKS AGAIN !!! Stay safe ! Those are some good looking trucks! Happy Holidays DCFD... stay safe and take care! My name is Andrew Vacca, grandson of Iona & Louis Terranova. I would like to take this opportunity to thank you for honoring my grandmother Iona on April 27th by lowering the American flag at your station. She was a wonderful grandmother and is missed dearly. Well done, keep up the great work. Congratulations Christie and Carl. On behalf of all of us at the Watch Hill Fire Department, best wishes for a happy and healthy life together!!! Very nice site. keep up the great work and stay safe! You guys are awesome. Thank you for all the good you do for the community. Great site! It's nice to be able to view your apparatus and information about your Department online. Hope you all stay safe! Greetings from the middle of Iowa, surronded by flat ground full of corn and beans. 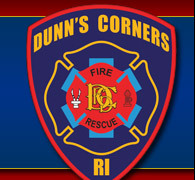 When looking on Google for Dallas Center Fire Department (DCFD) references, not only do I pick up the nation's capital fire department but Dunn's Corners. 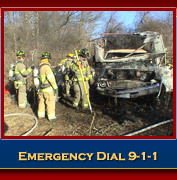 We are not quite as busy as either other DCFD, having 74 fire and rescue calls in 2009. Just ran across this site. My father was a member of the DCVFD back in the late 60's and early 70's. We lived on Shore Road near Noyes Neck, before any of the streets near Old Man Materese's property had formal names. I fondly remember the Smokey the Bear parade as it came down Shore road and we would come out and wave to Smokey. I am happy to hear it is still going on.... I also remember the horrific fire the destroyed Langwothy barn and the fire that burned through the woods on the back side of Dunn's Corners school. We also used to use the old fire house community room for our Cub Scout meetings. I was back there a couple of years ago and was sad to see the new modern fire station had replaced the old wood building. Thank you to all who have served in the past, are serving in the present and who will serve in the future. Mike: Please extend to your brave men & women our heartfelt thanks for their duty. Karl's memorial was a terrific tribute to a wonderful guy. It was a lot for me to register seeing all of the Firefighters from all over, DEM Officers (I worked with most of them) and the Forest Rangers. Karl will be missed by a whole lot of people. Again thanks to all for your service. I am so very proud of DCFD. Just learned of Karl's passing, my deepest sympathy to the Kenyon Family. You are in my thoughts and prayers. I want to let you know how much Karl's Fireman's Funeral meant to the whole family. It couldn't have been more perfect and fitting for Karl. The caring and the respect shown for Karl was so touching. Pat had to try very hard not to break down because she knew so many of you would also dissolve into tears. Great job! You did him proud. Thanks so much. To you and all your people, an "Outstanding Tribute" for Karl, a job well done. We're still certainly going to miss him every day, but it made the "move" a little easier. To the family if there is anything I can ever do just call. Thank you for the FANTASTIC "TRIBUTE" to Karl Kenyon. It was breath-taking! Your dedication and service to Westerly, the state and nation is exemplary and your brotherhood AWESOME! My sincerest thanks to all to contributed with such love and devotion. I met Karl Kenyon a long time ago when I first started out with the Massachusetts Forest Fire Control & on the Ma. wildfire team and served with him as a state representative for wildland firefighters crew mobilization of teams for the Northeast Fire Compact way back in the 90's. He was a hard worker and he help inspired and gave a lot of support to new recruits on the team when they responded to their first wildfire call up. You might say he was the team mascot " Pee Wee" or team peer member. Some people looked up to him like a father, brother and very dear devoted dedicated friend, colleague. We will miss him. Like many others, I had the privilege of meeting Karl through the NE Compact on fires, training exercises and meetings. He will be hard to replace. Karl exemplified the courage and commitment of all volunteers to the community. You have lost one of the finest. Our prayers are with you. My sincerest sympathies to your department on the passing today of Deputy Chief Karl Kenyon. I had the privilege of working with Karl many times over the years in his capacity with the DEM. He was a great guy and I will miss him, as I am sure you will, too.